Objective: To evaluate the toxicity against house fly Musca domestica L. (M. domestica)-larvicidal, pupicidal, and oviposition deterrent activities of essential oils (EOs) from five plants: Anethum graveolens L. (A. graveolens), Centratherum anthelminticum L. (C. anthelminticum), Foeniculum vulgare Mill. (F. vulgare), Pimpinella anisum L. (P. anisum), and Trachyspermum ammi L. (T. ammi) Sprague. 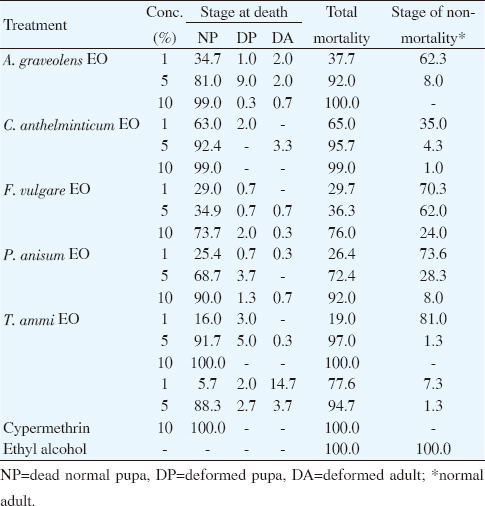 Methods: Dipping, topical and dual-choice assays were performed by using each EO at three concentrations (1%, 5% and 10%) as well as cypermethrin (positive control) and ethyl alcohol (negative control) in order to determine their larvicidal, pupicidal and oviposition deterrent activities against M. domestica mortality rate and morphogenic abnormality of larvae and pupae were recorded after 3 and 10 days of incubation. Oviposition deterrent activity was recorded for 5 consecutive days from the beginning of the assay. Results: All EOs at the highest concentration (10%) were highly effective in oviposition deterrent with 100% effective repellency and an oviposition activity index of -1.00. Ten percent of F. vulgare oil exhibited the highest efficacy against the larvae with 89.6% mortality rate at 3 days and an LC50 value of 5.4%. Ten percent of A. graveolens and T. ammi oils showed the highest efficacy against the pupae with 100% mortality and an LC50 value ranging from 1.81%-2.24%. Conclusions: These results indicate that F. vulgare, A. graveolens and T. ammi EOs are effective larvicidal, pupicidal and oviposition deterrent agents against house fly M. domestica. Musca domestica L. (M. domestica), also known as house fly, is one of the most common medical and veterinary insect pest in Thailand as well as throughout Southeast Asia and some other parts of the world,. It can cause serious diseases to humans and domestic animals, mechanically vectoring more than 100 human and domestic animal pathogenic organisms such as bacteria, virus, worm, parasite and protozoa and causing diseases such as food poisoning, diarrhea, cholera, bacillary dysentery, typhoid, paratyphoid, tuberculosis, salmonellosis, shigellosis, anthrax and myiasis in humans and animals,. Generally, chemical control has been the first option for house fly control, especially during an epidemic of these diseases during the summer season (usually from March to May). Organophosphate, carbamate and pyrethroid chemical insecticides had previously been effective for house fly control. Unfortunately, house flies have developed resistance to them. Moreover, they are also highly toxic to humans, domestic animals, non-target organisms and the environment. To make matters worse, they are persistent, non-biodegradable and biomagnified through the food chain,,. Therefore, house fly control by botanical insecticides should be a better alternative to using synthetic chemical insecticides. Botanical insecticides are ecofriendly, safe for the environment, and produce virtually no toxic effects to humans, domestic animals or non-target organisms. Botanical insecticides have a long history. The first documented successful botanical insecticide was pyrethrum that has been used for delousing ever since 400 B.C. The stories of this and other more modern botanical insecticides are reported in detail in a review paper. Plant essential oils (EOs) are some of the best botanical insecticides for house fly control. They have been demonstrated to be easily biodegraded in the environment and non-toxic to mammals, fish and birds,,. Several researchers have reported that plant EOs from garlic (Allium sativum), galangal (Alpinia galanga), ylang-ylang (Canaga odorata), star anise (lillicium verum), cinnamon (Cinnamomum verum), clove (Syzygium aromaticum), lemongrass (Cymbopogon citratus), peppermint (Mentha piperita), lavender (Lavandula angustifolia), calamodin (Citrus madurensis), sweet orange (Citrus sinensis), eucalyptus (Eucalyptus globulus), ginger (Zigiber officinale) and phlai (Zigiber cassumunar) showed high toxicity to larvae, pupae and adults of house fly,. 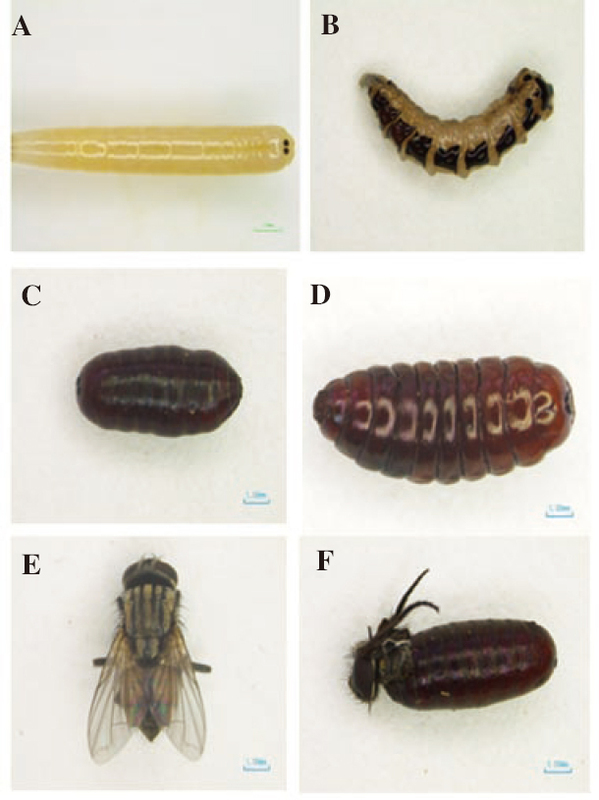 However, the number of published papers related to the oviposition deterent acitivity of EOs and morphogenic abnormality of larvae and pupae of house fly is limited. Umbelliferae plant EOs, especially EOs from Anethum graveolens (A. graveolens), Centratherum anthelminticum (C. anthelminticum), Foeniculum vulgare (F. vulgare), Pimpinella anisum (P. anisum), and Trachyspermum ammi (T. ammi), have long been used to prevent and treat certain human illnesses. It has been reported that they have antimicrobial, antioxidant, antibacterial, antifungal, antiseptic, antidepressant, antispasmodic, anticancer and antineuralgic properties,,,,. They have been shown to be highly toxic to mosquito, moth and insect pests of stored products but their larvicidal, pupicidal and oviposition deterrent activities against house fly have not been reported to date,,. Data on larvicidal, pupicidal and oviposition deterrent activities against house fly are important for devising a house fly control strategy that can totally eradicate house flies at their breeding sites and sensitive areas such as the indoor of a house, hospital, primary school, nursery, nursing home and restaurant. Thus, the objective of this study was to determine the toxicity of EOs from A. graveolens, C. anthelminticum, F. vulgare, P. anisum and T. ammi as well as that of cypermethrin (Detroid 10) and ethyl alcohol (Siribancha) against housefly: their larvicidal, pupicidal and oviposition deterrent activities in particular. The Umbelliferae plant materials were prepared from dried fruits of A. graveolens, C. anthelminticum, F. vulgare, P. anisum, and T. ammi purchased from Chao Krom Poe pharmacy, Bangkok, Thailand. All Umbelliferae specimens were positively identified by a plant taxonomist from King Mongkut’s Institute of Technology Lardkrabang, Bangkok, Thailand. They were extracted by a water distillation method in a modified Clevenger type apparatus for 6-8 h. After the EOs were extracted by distillation, they were removed of water with anhydrous sodium sulfate and kept in a refrigerator at 4 Ό until further use. All of the extracted Umbelliferae plant EOs was diluted with ethyl alcohol to 3 concentrations: 1%, 5% and 10% and kept under laboratory conditions [(27.5±2.0) °C, (72.5±2.0)% relative humidity (RH)] before subsequent uses in assays. Adult house flies M. domestica were collected from Lardkrabang market, Lardkrabang, Bangkok, Thailand and identified by an insect taxonomist from the Faculty of Agricultural Technology, King Mongkut’s Institute of Technology Lardkrabang, Bangkok, Thailand. The 50 collected house flies were reared in a cotton mesh cage (30 cm×30 cm×30 cm) at (27.5±2.0) °C and (72.5±2.0)% RH in an entomological laboratory under a photoperiod of 12 h light followed by 12 h dark (12 L: 12 D). For 2 days, they were fed with 50 g of powdered milk, 10 g of dog biscuit, and 10% w/v glucose soaked in cotton wool. Five cotton sheets served as their oviposition substrate. The house flies laid eggs on day 3 after they were fed. One hundred house fly eggs were transferred onto 300 g of mackerel fish meat placed on a plastic tray (18 cm×30 cm×10 cm) lined with sterile coconut husks. On day 4-7 after they were laid, the eggs hatched on this medium. The 1st instar larvae fed on the mackerel fish meat and developed into 2nd instar larvae, 3rd instar larvae then pupae. Fifty house fly pupae were collected and put in a plastic box (10 cm×15 cm×7 cm) lined with sterile coconut husks. The pupae metamorphosed into adult house flies within 5 days. Two-day-old third instar larvae and pupae and 3-day-old female adults were used in bioassays. A dipping method as reported by Al-Ghamdi et al was used as the larvicidal bioassay in this study. Ten third-instar larvae were selected and dipped into 10 mL of each test solution for 30 s then removed from the solution and transferred onto a filter paper in an insect box (7 cm×10 cm×5 cm in size) containing 3 g of mackerel fish meat and 2 g of moist coconut husk. Larval mortality was recorded on day 1, 2 and 3. The criterion for larval mortality was that no parts of their body were moving when prodded with a small brush. Three experimental runs were done for each kind of bioassay, and each run was performed in ten replicates. The negative and positive controls were ethyl alcohol and cypermethrin, respectively. For morphological aberration observation, dead larvae were removed from the box daily, counted and classified under a stereomicroscope. The classification criteria for larvae morphological aberrations were as follows: 1. NL=normal dead 3rd instar larvae, larvae that died with normal morphology; 2. DL=deformed larvae, larvae that died with abnormal morphology-the integument of the larvae was burned and swollen; 3. DP=deformed pupae, pupae that died with abnormal morphology-the integument of the pupae was swollen with shrunk exoskeleton; 4. DA=deformed adults, adults that died with abnormal morphology or adults that died attached to the pupal case or died partly emerged from the pupal case. Pupicidal bioassay was performed by using a topical application method. Ten 2-day-old pupae were placed in an insect box (7 cm×10 cm×5 cm). They were topically treated once with 10 μL of each test solution. Pupal mortality was checked by counting the number of un-emerged pupae after 7 days of treatment. Each test was performed in 10 replicates with a simultaneous control set. The negative and positive controls were ethyl alcohol and cypermethrin. The experiment was done in three replicates. For morphological aberration observation, dead pupae were removed daily, counted and classified under a stereomicroscope. The classification criteria for pupae morphological aberration were as follows: 1. NP=normal dead pupae, pupae that died with normal morphology; 2. DP=deformed pupae, pupae that died with abnormal morphology-the integument of the pupae was swollen with shrunk exoskeleton; 3. DA=deformed adults, adults that died with abnormal morphology-adults died attached to the pupal case or died partly emerged from the pupal case. where NT is the number of eggs laid in the treatment cup and NC is the number of eggs laid in the non-treatment cup. The interpretation of OAI is as follows: OAI=-1.0 indicates that the treatment was repellent to the flies, i.e., more eggs were laid in the non-treatment cup than in the treatment cup; and OAI=+1.0 indicates that treatment was attractant to the flies, i.e., more eggs were laid in the treatment cup than in the non-treatment cup. where NT is the number of eggs in the treatment cup and NC is the number of eggs in the non-treatment cup. The interpretation of ER is as follows: ER=98%-100% means strongly deterrent; ER=80%-97% means fairly deterrent; ER=50%-80% means moderately deterrent; and ER<50% means not deterrent. Means of larvae and pupae mortality were analyzed by standard probit analysis in order to obtain LC50 and LC90 for each treatment agent. The mortality data were used to compare the five EOs and the controls. Significant differences were analyzed by one-way analysis of variance and Duncan’s Multiple Range Test with a software program called SPSS for windows. If the mortality caused by the negative control had exceeded 20%, the whole test would have been rejected and then repeated. The larvicidal activity results of five Umbelliferae plant EOs against the 3rd instar larvae of house fly are summarized in [Table 1]. The EOs from all Umbelliferae plants at the highest tested concentration (10%) exhibited the highest mortality rates against house fly larvae; the mortality rate increased as the tested concentration increased from 1% to 5% to 10%. All EOs at 10% concentration effected mortality rates ranging from (20.0%±18.9%) to (89.3%±14.7%), and the ranges of their LC50 and LC90 were (5.4%-15.4%) and (9.9%-29.8%), respectively. Ten percent F. vulgare EO exhibited the highest larvicidal activity with a mortality rate of (89.3%±14.7%) at 3 days and an LC50 value and an LC90 value of 5.4% and 9.9%, respectively. The ranks of Umbelliferae plant EOs according to their effectiveness as a larvicidal agent against house fly larvae were as follows: F. vulgare EO (10%) >P. anisum EO (10%) >T. ammi EO (10%) >A. graveolens EO (10%) > C. antheminticum EO (10%). Cypermethrin (positive control) at all tested concentrations was also highly toxic to house fly larvae with a mortality rate of (100%±0.0%) and an LC50 value and an LC90 value of <1.0%, while ethyl alcohol (negative control) did not show any larvicidal activity at all. 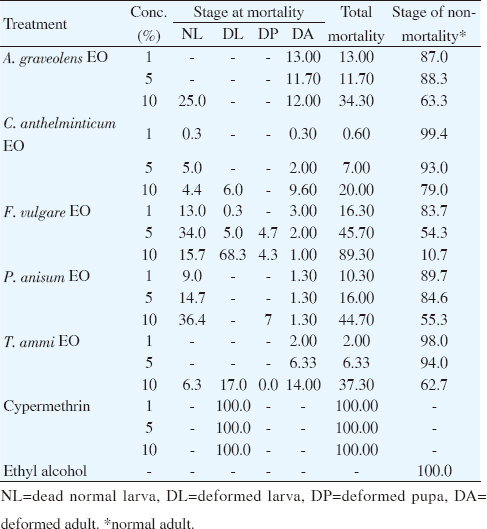 Table 1: The mortality rate and LC values of M. domestica larvae to five Umbelliferae plants EOs, cypermethrin and ethyl alcohol at 3 days (%). Mortality rate and morphological aberrations of house fly larvae are presented in [Table 2]. Umbelliferae plant EOs at all tested concentrations caused mortality and morphological abnormality at death of most house flies in the larval stage. The morphological aberration forms varied with EO’s concentration-a higher concentration induced a larger variety of forms of morphological aberration than a lower concentration did. Ten percent F. vulgare EO and T. ammi EO caused 68.3% and 17.0% mortality rates of dead larvae with deformed morphology, respectively. Deformed larvae were identified as the larvae that died with abnormal morphology and their larval integument was burned and swollen. Deformed adults were identified as the adults that died with abnormal morphology or the adults that died attached to the pupal case or partly emerged from the pupal case. Cypermethrin at all tested concentrations effected deformed larvae at 100% mortality rate while ethyl alcohol did not cause any mortality nor any morphological aberrations of house fly larvae [Figure 1]. Table 2: Mortality rate and morphology aberrations of M. domestica larvae after exposure at 3 days (%). A: NL=normal dead 3rd instar larva; B: DL=deformed larva; C: DP=deformed pupa; D: NP=normal dead pupa; E: DA=deformed adult; F: NA=Normal adult. All pupicidal activity results for the five Umbelliferae plant EOs against house fly pupae are shown in [Table 3]. As their concentration increased from 1% to 5% to 10%, all Umbelliferae plant EOs were increasingly more effective. All Umbelliferae plant EOs at 10% concentration effected high mortality rates, ranging from (76.0%±16.3%) to (100.0%±0.0%) with LC50 values and LC50 values ranging from (0.9%-5.8%) and (4.1%-14.9%), respectively. Ten percent of EOs from T. ammi and A. graveolens showed the highest toxicity against house fly pupae with the highest mortality rate of (100.0%±0.0%) at 10 days and an LC50 of 2.2% and 1.8% and an LC90 of 4.1% and 4.7%, respectively. The other Umbelliferae plant EOs effected mortality rates ranging from (76.0±16.3)% to (99.0%±3.1%) with LC50 values ranging from (0.9%-5.8%) and LC50 values ranging from (4.6%-14.9%). The ranks of umbelliferae plant EOs according to their effectiveness as a pupicidal agent against house fly pupae were as follows: A. graveolens EO (10%) >T. ammi EO (10%) > C. antheminticum EO (10%) >P. anisum EO (10%) >F. vulgare EO (10%). Cypermethrin at all tested concentrations effected mortality rates ranging from (77.6%±10.1%) to (100.0%±0.0%) with an LC50 of <1.0% and an LC90 of 3.2%, while alcohol did not show any pupicidal activity. Table 3: The mortality rate and LC50 values of M. domestica pupae to five Umbelliferae plants EOs, cypermethrin and ethyl alcohol at 10 day (%). All of the Umbelliferae plant EOs at all tested concentrations effected high mortality rates and induced morphological abnormalities of house flies in their pupal stage. The results are summarized in [Table 4]. Most Umbelliferae plant EOs at all tested concentrations caused the highest mortality rate of normal dead pupae. Dead pupae was identified as the pupae that died with normal morphology. Ten percent of EOs from, T. ammi, A. graveolens, C. antheminticum, P. anisum and F. vulgare effected 100.0%, 99.0%, 99.0%, 90.0% and 73.3% mortality rates of normal dead pupae and 10% cypermethrin effected 100% mortality rates of normal dead pupae, but ethyl alcohol did not kill any pupae and did not cause any morphological abnormality of forms. All Umbelliferae plant EOs at 1%, 5% and 10% concentrations caused pupae deaths as deformed pupae with mortality rates ranging from 0.7%-3.0%, 0.7-9.0% and 0.3%-2.0%, respectively. Deformed pupae was pupae that died with abnormal morphology or their pupal integument was swollen with shrunk exoskeleton at the time of death. All Umbelliferae plant EOs at 1%, 5% and 10% concentrations caused mortality of deformed adults at rates ranging from 0.3%-2.0%, 0.3-3.4% and 0.7%-1.3%, respectively [Table 4], [Figure 1]. Table 4: Mortality rate and morphology aberrations of M. domestica pupae after exposure at 10 days (%). The oviposition deterrent activities of five Umbelliferae plant EOs and cypermethrin against female adults of house flies are presented in [Table 5]. All Umbelliferae plant EOs at a high concentration (10%) exhibited high percentage ER against female house flies, and as their concentration increased from 1% to 5% to 10%, the effectiveness of all Umbelliferae plant EOs correspondingly increased. Ten percent of all Umbelliferae plant EOs showed the highest oviposition deterrent activity with the highest percentage effective repellency at 100% and an OAI of -1.0. Moreover, 5% EOs from A. graveolens, C. antheminticum and T. ammi also showed the highest oviposition deterrent activity with the highest effective repellency at 100% and an OAI of -1.0. One percent of all Umbelliferae plant EOs showed a fair to moderate oviposition deterrent activity with 42.40% to 87.78% ER and an OAI ranging from 0.21 to -0.78. At the same time, all concentrations of cypermethrin exhibited the highest oviposition deterrent activity with 100% ER and -1.0 OAI. The ranks of Umbelliferae plant EOs according to their effectiveness as a oviposition deterrent agent against female house flies are as follows: T. ammi EO (10%)>C. antheminticum EO (10%)>A. graveolens EO (10%)>F. vulgare EO (10%)>P. anisum EO (10%). 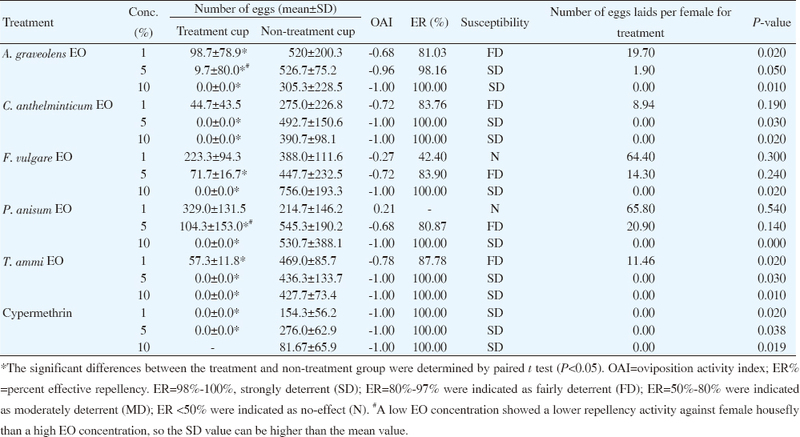 Table 5: The oviposition deterrent activities of the five Umbelliferae plant EOs in three concentrations (1%, 5% and 10%) against M. domestica females. The following are reported pharmacological activities of F. vulgare EO: antimicrobial, antiviral, anti-inflammatory, antiallergic, hepatoprotestive, antixiolytic and anti-stress, while those of A. graveolens EO are as follows: antiallergic, antimicrobial, antiviral, anti-inflammatory, antixiolytic and anti-stress, and the reported pharmacological activities of T. ammi EO are as follows: analgesic, antinociceptive, anthelmintic, antifilarial, antiinflammatory, antiplatelet, antimicrobial, and antiviral. The test results showed that the three EOs from F. vulgare, A. graveolens and T. ammi exhibited strong activities against the larvae and pupae of house fly as well as a very strong oviposition deterrent activity. They have a good potential for being developed into a powerful agent for controlling all stages of house fly in their life cycle. F. vulgare is an important medicinal plant belonging to the Umbelliferae family. Its common name is fennel. It originated from southern Mediterranean region and now grows wild throughout Asia, North America and Europe. Fennel is well known in Thailand as ‘Thian klaep’,. It has been used for a long time in traditional Thai medicine as an aromatic ingredient. By itself, it is carminative, expectorant, tonic, digestive and diuretic. The fruits and seeds of F. vulgare are also used as an aromatic food additive in ice cream, alcoholic beverages as well as meat and fish dishes,. Ten percent F. vulgare EO was noted to be the most toxic to house fly larvae. Most larvae that died because of this EO died as dead normal larvae. In the same vein, papers published in 2018 reported that 5% and 10% F. vulgare EO showed a high larvicidal activity against Aedes aegypti (Ae. aegypti) mosquito with 100% mortality at 24 h and an LT50 value of 3.4 h. Most larvae that died because of this EO died as dead normal larvae. F. vulgare EO also showed a strong adulticidal activity against M. domestica with an LD50 value ranging from 82-89 μg/adult. In addition, F. vulgare EO was highly effective against the 4th instar larvae of Ae. aegypti, Anopheles dirus, Anopheles stephensi (An. stephensi) and Culex pipiens (Cx. pipiens) mosquitoes,, and exhibited a high repellent activity against Ae. aegypti females,. This EO has also been shown to be highly toxic to three important insect pests of stored-product (Sitophilus oryzae, Callosobruchus chinensis and Lasioderma serricorne). The major chemical components of F. vulgare EO are monoterpenes, trans-anethole, estragole, fenchone, methyl chavicol, eugenol, limonene, p-anisadehyde, α-phellandrene, γ-terpineol, α-pinene, p-cymene and 1,8-cineole,,. These monoterpenes have been shown to have an insecticidal activity against house fly. Moreover, p-cymene, 1,8-cineole and limonene as fumigants were more toxic to adult house flies than all of the other chemical components mentioned above. Fenchone from F. vulgare EO was found to inhibit the activity of cholinergic system of insects. The 1,8-cineole and γ-terpineol monoterpenoids from this EO were found to inhibit photoreception of Cx. pipiens compound eyes. In addition, trans-anethole and limonene were shown to be highly toxic to insect neuron cells. In the present investigation, house fly larvae exposed to F. vulgare EO died with abnormalities such as becoming pigmented, having dark colored cuticle, shrunken or its body becoming twisted. This EO might penetrate into the cuticle of house fly larvae, inhibiting the activities of their nervous system and interfering with their metamorphosis. More importantly, F. vulgare EO shows very low toxicity to mammals; its LD50 value against rats is 3 120 mg/kg; it also has a very low persistence effect on the environment,. Therefore, F. vulgare EO has a good potential as a natural larvicide for controlling house fly larvae. In this respect, field trials at real house fly breeding sites are needed to be carried out to further explore its practical use. Against house fly pupae, 10% A. graveolens EO showed the highest toxicity; it caused the highest mortality rate of dead normal pupae. A. graveolens is a medicinal and aromatic plant. It belongs to the Umbelliferae family. Its common name is dill. Dill is well known in Thailand as ‘Thian ta takkataen’ and used in traditional Thai medicine for a long time as carminative, expectorant, tonic, digestive and diuretic. The leaves, stem and fruits of A. graveolens are well known to be aromatic and used as a common spice in Thai cuisine,. In the same vein, 5% and 10% of A. graveolens EO has been reported to show high toxicity against the pupae of Ae. aegypti mosquito with 100% mortality at 72 h and an LT50 value ranging from 6.7 h to 10.3 h. It also caused the highest morphological abnormality in dead pupae. In addition, EO from A. graveolens seed exhibited a high fumigant toxicity against adult house flies with a mortality rate ranging from 33.3% to 70.0% at 3 h. In another report, EO from A. graveolens fruits showed high toxicity against Aedes albopitus, Anopheles stephensi and Anopheles gambiae larvae and adults of other insect pests such as Cx. pipiens, Periplanita americana, Tribolium castaneum and Callosobrucus maculatus,,,. The main chemical components of A. graveolens EO are carvone (57.3%), limonene (33.2%), α-pinene, ß-pinene, α-phellandrene, p-cymene, carvacrol and a-terpinene,,. Carvone, p-cymene and carvacrol from this EO showed high toxicity against adult house flies. Carvacrol, α-pinene, β-pinene and phellandrene were highly toxic to the larvae of Ae. aegypti and Cx. pipiens; they have been reported to be toxic to the neuron cells of many insects. In the present investigation, house fly pupae exposed to A. graveolens EO died with abnormalities such as contorted body and shrunk or malformed body. This EO might penetrate into the cuticle of house fly pupae and exert its toxicity to the neurons of their nervous system, inhibiting the normal process of morphologenesis and metamorphosis. In this study, A. graveolens EO exhibited a strong pupicidal activity, thus it has a good potential as an agent for controlling house fly pupae. A. graveolens EO can be used in places where house flies usually breed in order to control pupae population. House fly life cycle will be disrupted, and its population growth will be reduced. Plant EOs disrupts an important female mosquitoes’ behavior: ovipositioning behavior or search attempt for a suitable ovipositioning area. In this study, T. ammi EO at all tested concentrations exhibited the highest repellency and oviposition deterrent activity against female house flies. T. ammi EO also showed high ovicidal and oviposition deterrent acitivities against Callosobruchus chinensis eggs and females. This EO exhibited high toxicity against the larvae of An. stephensi and adults of Tribolium castaneum and German cockroach, Blattella germanica,,,. The common name of T. ammi is ajwain or ajowan. It originated from India and became widely distributed in Afganistan, Iran, Pakistan and Europe. This plant has been used as medicie and food. It is well known in Thailand as ‘Thain yaowa phani’ and has been used in traditional Thai medicine for a long time as anti-emetic, blood tonic, expectorant and carminative. The main chemical constituents of the EO from T. ammi fruit are thymol (63.4%), α-terpinene (16.9%) and p-cypermene (19.0%). In a previous report, thymol and p-cypermene from plant EOs as fumigants were found to be highly toxic against house fly adults. In addition, p-cypermene and γ-terpinene as fumigants showed high toxicity against both females and males of Blattella germanica. In the same vein, thymol was demonstrated to have strong contact toxicity against both sexes of Blattella germanica. Moreover, thymol from plant EOs such as from Thymus vulgaris and T. ammi also showed high toxicity against insects: a high inhibitory activity against two neurotransmitters (gamma-aminobutyric acid and octopamine) of insect’s nervous system. The following explanation for the results from this study is offered: T. ammi EO and its chemical constituents might penetrate into the tarsal and labial cuticles of female house flies and inhibit the activities of their neuron cells and ovipositor. This EO also showed the highest effective repellency against female house flies, hence we proposed it as a good natural oviposition deterrent agent for controlling female house flies that needs some field trials at real house fly breeding sites to validate whether it can be a practical natural house-fly oviposition deterrent agent for full control of house fly population or not. The results from this study indicate that EOs from F. vulgare, A. graveolens and T. ammi would be highly toxic to house flies at all stages of their life cycle. Their larvicidal, pupicidal and oviposition deterrent efficacies were much higher than ethyl alcohol (the negative control) but slightly lower than cypermethrin (the positive control) in larvicidal activity and equivalent to cypermethrin in pupicidal and oviposition deterrent efficacies. Cypermethrin is a synthetic pyrethroid. It is a broad-spectrum insecticide in wide scale use globally for controlling agricultural, medical and veterinary insect pests such as insect pests of plants and vegetables, insect pest of stored products, mosquito vectors, house fly and horse fly. Unfortunately, cypermethrin has been indicated to be moderately hazardous to humans by World Health Organization. To make matters worse, cypermethrin is highly toxic to fishes, beneficial insects and other predatorial and parasitic insects such as honey bee, digger bee, leaf cutting bee, trichogramma, braconid and ensign wasp. Its harmful effects to human and animal health are such as cytogenesis effect on human lymphocytes, induction of apoptosis in human neuroblastoma cells causing neuroblastoma in children, and oxidative stress effect on female reproductive system of rats and rabbits,,. Our results indicate that F. vulgare, A. graveolens and T. ammi EOs would be effective against house fly at all stages of it life cycle. The EOs have a good potential to be developed into an effective, all-around, natural larvicidal, pupicidal and oviposition deterrent agent for completely controlling house fly population, especially at their breeding and ovipositioning sites. Most importantly, they are much safer to humans and biodegrades in the environment much faster than cypermethrin. Finally, the findings from this study can be used for further development of these EOs into a practical agent that can truly disrupt all stages of house fly life cycle and effectively reduce the whole of its population, hence they can help reduce all serious diseases vectored by house flies to human beings. The authors confirm that they have no conflicts of interest with any parties whatsover regarding the content of this article. This research was supported by King Mongkut’s Institute of Technology Ladkrabang, Ladkrabang, Bangkok 10520, Thailand (Grant No.2560-01-04-001) and The National Research Council of Thailand (Grant No. GRAD6006KMITL). Kamaraj C, Rajakumar G, Rahuman AA, Velayutham K, Bagavan A, Zahir AA, et al. Feeding deterrent activity of synthesized silver nanoparticles using Manilkara zapota leaf extract against the house fly, Musca domestica (Diptera: Muscidae). Parasitol Res 2012; 111(6): 2439-2448. Khan HaA, Akram W, Arshad M , Hafeez F. Toxicity and resistance of field collected Musca domestica (Diptera: Muscidae) against insect growth regulator insecticides. Parasitol Res 2016; 115(4): 1385-1390. Sinthusiri J, Soonwera M. Oviposition deterrent and ovicidal activities of seven herbal essential oils against female adults of housefly, Musca domestica L. Parasitol Res 2014; 113(8): 3015-3022. Morey RA , Khandagle AJ. Bioefficacy of essential oils of medicinal plants against housefly, Musca domestica L. Parasitol Res 2012; 111(4): 1799-1805. Shah RM, Shad SA, Abbas N. Mechanism, stability and fitness cost of resistance to pyriproxyfen in the house fly, Musca domestica L.(Diptera: Muscidae). Pestic Biochem Physiol 2015; 119: 67-73. Khan H, Abbas N, Shad SA, Afzal MB. Genetics and realized heritability of resistance to imidacloprid in a poultry population of house fly, Musca domestica L. (Diptera: Muscidae) from Pakistan. Pestic Biochem Physiol 2014; 114: 38-43. Scott JG, Leichter CA, Rinkevihc FD, Harris SA, Su C, Aberegg LC, et al. Insecticide resistance in house flies from the United States: Resistance levels and frequency of pyrethroid resistance alleles. Pestic Biochem Physiol 2013; 107(3): 377-384. Pavela R. History, presence and perspective of using plant extracts as commercial botanical insecticides and farm products for protection against insects-a review. Plant Protect Sci 2016; 52(4): 229-241. Kumar P, Mishra S, Malik A, Satya S. Compositional analysis and insecticidal activity of Eucalyptus globulus (family: Myrtaceae) essential oil against housefly (Musca domestica). Acta Trop 2012; 122(2): 212-218. Sinthusiri J, Soonwera M. Efficacy of herbal essential oils as insecticides against the housefly, Musca domestica L. Southeast Asian J Trop Med Public Health 2013; 44(2): 188-196. Kumar S, Mishra M, Wahab N, Warikoo R. Larvicidal, repellent, and irritant potential of the seed-derived essential oil of Apium graveolens against dengue vector, Aedes aegypti L. (Diptera: Culicidae). Front Public Health 2014; 2(147): 1-6. Evergetis E, Michaelakis A , Haroutounian SA. Exploitation of Apiaceae family essential oils as potent biopesticides and rich source of phellandrenes. Ind Crops Prod 2013; 41(1): 365-370. Babri RA, Khokhar I, Mahmood Z, Mahmud S. Chemical composition and insecticidal activity of the essential oil of Anethum graveolens L. seeds. Sci Int (Lahore) 2012; 24(4): 453-355. Amanpour A, Kelebek H, Selli S. Aroma constituents of shade-dried aerial parts of Iranian dill (Anethum graveolens L.) and savory (Satureja sahendica Bornm.) by solvent-assisted flavor evaporation technique. Food Measure 2017; 11(3): 1430-1439. Singh S, Das S, Singh G, Perotti M, Schuff C, Catalan C. Comparative studies of chemical composition, antioxidant and antimicrobial potentials of essential oils and oleoresins obtained from seeds and leaves of Anethum graveolens L. Toxicol Open Access 2017; 3(1): 2-9. Shah S, Patel K, Suraj K. Evaluation of anti-asthmatic activity of Centratherum anthelminticum Linn. in experimental animals. J Pharm Res 2017; 16(1): 19-24. Traboulsi AF, El-Haj S, Tueni M, Taoubi K, Nader NA, Mrad A. Repellency and toxicity of aromatic plant extracts against the mosquito Culex pipiens molestus (Diptera: Culicidae). Pest Manag Sci 2005; 61(6): 597-604. Sousa RMOF, Rosa JS, Oliveira L, Cunha A , Fernandes-Ferreira M. Activities of Apiaceae essential oils and volatile compounds on hatchability, development, reproduction and nutrition of Pseudaletia unipuncta (Lepidoptera: Noctuidae). Ind Crops Prod 2015; 63: 226-237. Chaubey MK. Insecticidal activity of Trachyspermum ammi (Umbelliferae), Anethum graveolens (Umbelliferae) and Nigella sativa (Ranunculaceae) essential oils against stored-product beetle Tribolium castaneum Herbst (Coleoptera: Tenebrionidae). Afr J Agric Res 2007; 2(11): 596-600. Al-Ghamdi KM, Saleh M, Mahyoub J, Asid AN, Al-Najada AR, Alfarhan B. Potential studies of non-conventional chemicals against the housefly larvae Musca domestica L. Life Sci J 2014; 11(12): 1046-1049. Zoubiri S, Baaliouamer A, Seba N , Chamouni N. Chemical composition and larvicidal activity of Algerian Foeniculum vulgare seed essential oil. Arab J Chem 2014; 7(4): 480-485. Chahal K, Monika AK, Bhardwaj U, Kaur R. Chemistry and biological activities of Anethum graveolens L.(dill) essential oil: A review. J Pharmacogn Phytochem 2017; 6(2): 295-306. Badgujar SB, Patel VV, Bandivdekar AH. Foeniculum vulgare Mill: a review of its botany, phytochemistry, pharmacology, contemporary application, and toxicology. Biomed Res Int 2014; 2014: 842674. Smitinand T. The forest herbarium. In: Thai plant name. Revised edition. Thailand: Royal Forest Department; 2001. p. 809. Faculty of Pharmacy, Mahidol University. Medicinal plants in Siri Ruckhachati garden. 1st ed. Bangkok: Amarin Printing Group;1992. p. 257. Rather MA, Dar BA, Sofi SN, Bhat BA, Qurishi MA. Foeniculum vulgare: a comprehensive review of its traditional use, phytochemistry, pharmacology, and safety. Arab J Chem 2016; 9: 1574-1583. Chantawee A , Soonwera M. Efficacies of four plant essential oils as larvicide, pupicide and oviposition deterrent agents against dengue fever mosquito, Aedes aegypti Linn. (Diptera: Culicidae). Asian Pac J Trop Biomed 2018; 8(4): 217-225. Pavela R, Zabka M, Bednar J, Triska J, Vrchotova N. New knowledge for yield, composition and insecticidal activity of essential oils obtained from the aerial parts or seeds of fennel (Foeniculum vulgare Mill). Ind Crops Prod 2016; 83: 275-282. Pavela R. Essential oils for the development of eco-friendly mosquito larvicides: a review. Ind Crops Prod 2015; 76: 174-187. Sedaghat M, Dehkordi AS, Abai M, Khanavi M, Mohtarami F, Abadi YS, et al. Larvicidal activity of essential oils of Apiaceae plants against malaria vector, Anopheles stephensi. J Arthropod-Borne Dis 2011; 5(2): 51-59. Tawatsin A, Asavadachanukorn P, Thavara U, Wongsinkongman P, Bansidhi J, Boonruad T, et al. Repellency of essential oils extracted from plants in Thailand against four mosquito vectors (Diptera: Culicidae) and oviposition deterrent effects against Aedes aegypti (Diptera: Culicidae). Southeast Asian J Trop Med Public Health 2006; 37(5): 915-931. Seo SM, Jung CS, Kang J, Lee HR, Kim SW, Hyun J, et al. Larvicidal and acetylcholinesterase inhibitory activities of Apiaceae plant essential oils and their constituents against Aedes albopictus and formulation development. J Agric Food Chem 2015; 63(45): 9977-9986. El Zayyat EA, Soliman MI, Elleboudy NA, Ofaa SE. Bioefficacy of some Egyptian aromatic plants on Culex pipiens (Diptera: Culicidae) adults and larvae. J Arthropod-Borne Dis 2017; 11(1): 147-155. Pavela R, Benelli G. Essential oils as ecofriendly biopesticides? Challenges and constraints. Trends Plant Sci 2016; 21(12): 1000-1007. El-Wakeil NE. Botanical pesticides and their mode of action. Gesunde Pflanzen 2013; 65(4): 125-149. Rocha DK, Matosc O, Novoa MT, Figueiredo AC, Delgado M, Moiteiro C. Larvicidal activity against Aedes aegypti of Foeniculum vulgare essential oils from Portugal and Cape Verde. Nat Prod Commun 2015; 10(4): 677-682. Ruangamnart A, Buranaphalin S, Temsiririrkkul R, Chuakul W, Pratuangdejkul J. Chemical compositions and antibacterial activity of essential oil from dill fruits (Anethum graveolens L.) cultivated in Thailand. Mahidol Univ J Pharm Sci 2015; 42(3): 135-143. Kweka EJ, Lima TC, Marciale CM, De Sousa DP. Larvicidal efficacy of monoterpenes against the larvae of Anopheles gambiae. Asian Pac J Trop Biomed 2016; 6(4): 290-294. Osanloo M, Sereshti H, Sedaghat MM, Amani A. Nanoemulsion of dill essential oil as a green and potent larvicide against Anopheles stephensi. Environ Sci Pollut Res 2017; 25(7): 6466-6473. Ebadollahi A. Plant essential oils from Apiaceae family as alternatives to conventional insecticides. Ecologia Balkanica 2013; 5(1): 149-172. Zarshenas MM, Moein M, Samani SM, Petramfar P. An overview on ajwain (Trachyspermum ammi) pharmacological effects; modern and traditional. J Nat Med 2013; 14(1): 98-105. Torabi-Pour H, Shayeghi M, Vatandoost H, Abai MR. Larvicidal effects and phytochemical evaluation of essential oils of Trachyspermum ammi and Ziziphora clinopodioides against larvae Anopheles stephensi. J Herb Med Pharmacol 2017; 6(4): 185-190. Yeom HJ, Kang JS, Kim GH, Park IK. Insecticidal and acetylcholine esterase inhibition activity of Apiaceae plant essential oils and their constituents against adults of German cockroach (Blattella germanica). J Agric Food Chem 2012; 60(29): 7194-7203. Gandomi H, Abbaszadeh S, Jebellijavan A, Sharifzadeh A. Chemical constituents, antimicrobial and antioxidative effects of Trachyspermum ammi essential oil. J Food Process Preserv 2014; 38(4): 1690-1695. Faculty of Pharmaceutical Sciences, Ubon Ratchathani University. Ajowan 2018 [Online]. Available from: www.Thaicrudedrug.com [Accessed on 10th May 2018]. Sallam M, Ahmad M, Ahmad I, Gul S, Idrees M, Bashir M, et al. Toxic effects of cypermethrin on the reproductive functions of female rabbits and their amelioration with vitamin E and selenium. Pak Vet J 2015; 35(2): 193-196. World Health Organization. WHO specifications and evaluations for public health pesticides. [Online]. Available from: http://www.who.int/whopes/quality/sbioallethrin _permethrin_eval_march_2006.pdf. [Accessed on 10th May 2018]. Raszewski G, Lemieszek MK, Lukawski K, Juszczak M, Rzeski W. Chlorpyrifos and cypermethrin induce apoptosis in human neuroblastoma cell line SH-SY5Y. Basic Clin Pharmacol Toxicol 2015; 116(2): 158-167. Kalyan Chakravarthi B, Naravaneni R, Philip G. Study of cypermethrin cytogenesis effects on human lymphocytes using in-vitro techniques. J Appl Sci Environ Manage 2007; 11(2): 77-81.